Ukraine cannot receive official information from the Russian side about the Ukrainian sailors captured in the Kerch Strait, Ukrainian Foreign Minister Pavlo Klimkin has reported. "We cannot get any official information about our sailors. And we receive information from many sources ... Now our efforts are focused on creating a wave of international pressure on Russia to free our people and ships," the minister said at a joint press conference with Polish colleague Jacek Czaputowicz in Kyiv on Saturday. 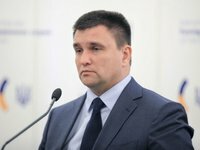 Klimkin stressed that Russia should not avoid punishment for acts of aggression. "With the Polish partners, we are talking about additional possibilities of using other formats and channels of pressure on Russia," the minister concluded. According to him, during the first meetings of the world leaders with President of the Russian Federation Vladimir Putin at the G20 summit, the demands for the release of Ukrainian sailors and ships, as well as unblocking free shipping through the Kerch Strait were voiced.